Usha Uthup is a well-known Indian pop singer, whose voice is said to have immense power. She is a strong woman who is not afraid of challenges. And this is something that all of us can learn from Usha Uthup. Due to fear of failure, we seldom move out of our comfort zone and as a result, we don’t witness growth in our lives. Usha Uthup, born in a Tamil Brahmin family, was fluent in Tamil, but she did not use this as an excuse to sing Tamil songs alone. She took up the challenge of singing in other languages that she was unfamiliar with to reach as many audiences as possible. 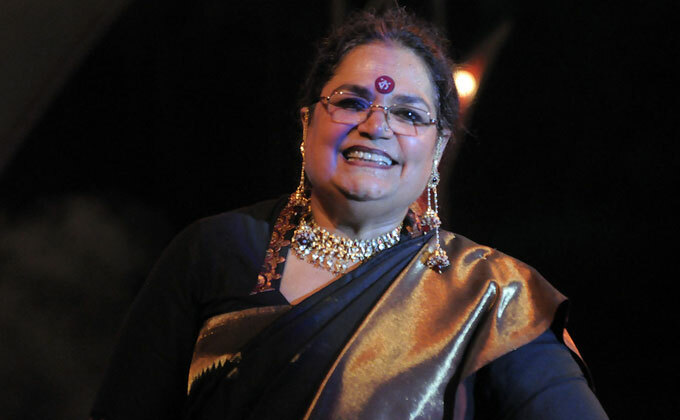 Throughout her singing career, Usha Uthup has sung in 15 Indian languages, including Hindi, Punjabi, Bengali, Gujarati, Marathi, Kannada, Tamil, and Telugu, and a number of foreign languages, including French, German and Italian. Usha Uthup has three sisters, all of whom are singers, and two brothers. Usha Uthup never had formal training in music – in fact, in school she was thrown out of the music class because her voice was different than others. But that did not stop Usha Uthup from pursuing her dream. She was passionate about singing and no rejection could put an end to her passion. This is something that all of us have to learn from Usha Uthup. Today’s youths are afraid of failure and when they face a rejection in life, they become depressed and think that their future is tarnished. No matter how tough life is we should be strong and fight back. Usha Uthup’s first public singing occurred when she was nine. Usha Uthup’s sisters, who were exploring a career in music then, took her to a musician called Hamir Sayani who gave her the opportunity to sing on the Ovelteen Music Hour on Radio Ceylon. She gave an outstanding performance and she was later called to sing at other events too. When Usha Uthup was 20, she started singing in a nightclub in Chennai and her performance was so well-received that the owner of the nightclub requested her to sing for a week. Then, she began singing in nightclubs and hotels across the country. It was at one of her performances at a nightclub that a film crew was mesmerized by her singing and offered her a chance to do playback singing. From there, her Bollywood career took off and her first song ‘Hare Rama Hare Krishna’ became such a big hit that offers came pouring in. And today, Usha Uthup is a well-known singer not only in India but around the world. Given her success in the singing career, she is often invited on singing reality shows and competitions as a judge. For her great contribution to the field of music, Usha Uthup has been given a number of awards, including the Padma Shri, Filmfare Award for the Best Female Playback Singer in 2011 and Kalakar Awards. Today, Usha Uthup is happy married with two children and she is considered an icon of modern Kolkata. Usha Uthup could not have come this far without her determination to succeed. In spite of the obstacles along the way and the stigma attached to signing in nightclubs, she rose in her career and has proven to the world that ‘nothing is impossible’. Without formal training in singing, Usha Uthup has mastered the art of singing not only in one or two languages but in over 20 languages. That is a great achievement and a reminder to all of us that challenges are present in every field but the way we handle these challenges determines our success or failure.